Parmesan Roasted Carrots with delicious garlic and baked in the oven will provide you with a carrot side dish you cannot get enough of! Savory garlic and a fresh Parmesan cheese make every bite a mouthwatering treat. Love Carrots? I really, really do and you can try them in a variety of ways! My favorite carrot side dishes are Honey Glazed Carrots, Cinnamon Carrots with Brown sugar, and Roasted Rosemary Carrots. This carrot recipe is so easy and is one of the best you will taste. 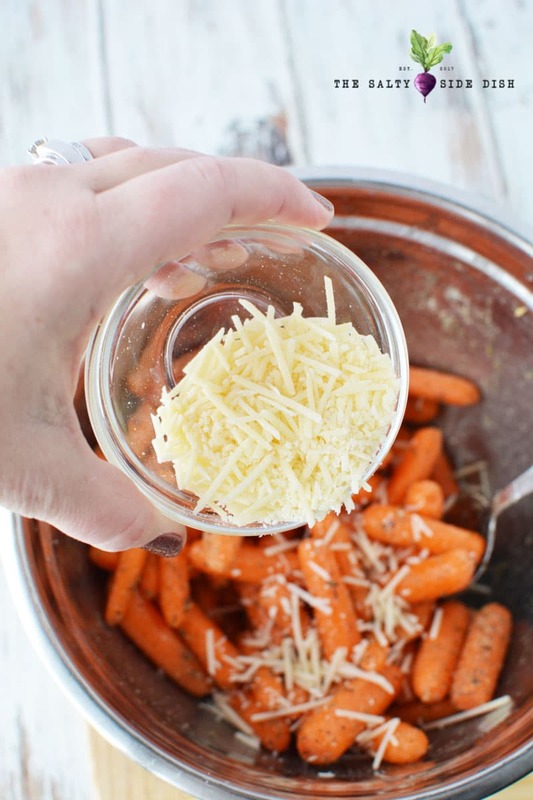 I love simple ingredients and you cannot go wrong whipping up fresh carrots marinated in nothing but seasoning and cheese. 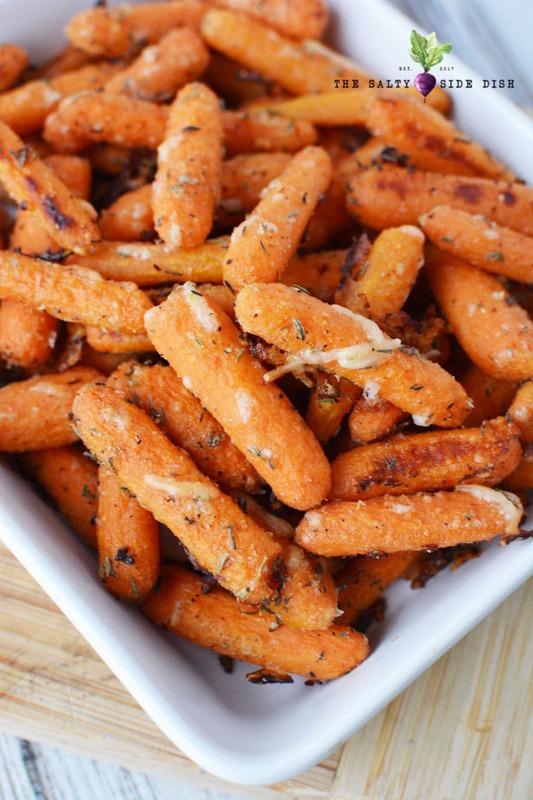 Buttery and mouth watering, we typically never have any of these baby carrots left over! No matter whether you are looking for a healthy hearty snack, a vegetarian dinner, or an easy side dish, these Parmesan Roasted carrots with thyme and garlic have got your back. This no pre- boil, no peel mix and go recipe is a perfect fall back recipe any night of the week. Preheat oven to 375 and grease a baking sheet with nonstick cooking spray. Set aside. 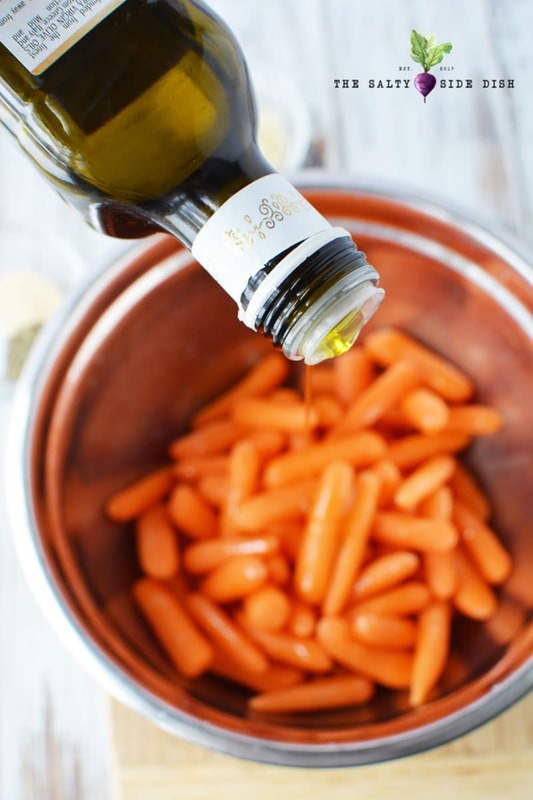 Add carrots to a mixing bowl and drizzle with olive oil. Mix well until all carrots are coated. 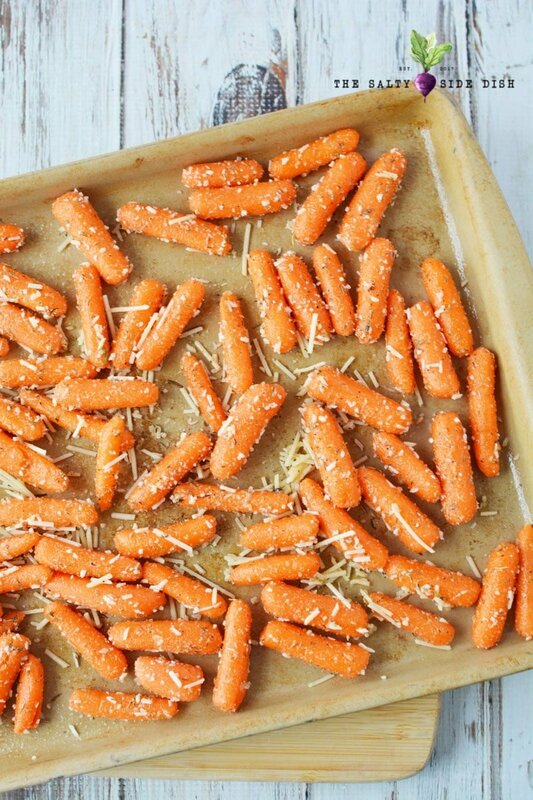 Add seasoning and grated cheese and mix well, taking care that there is cheese on every carrot. 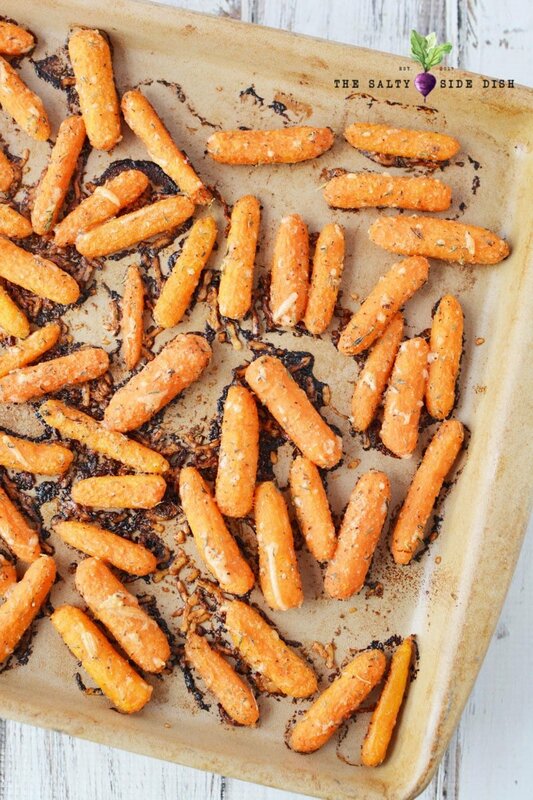 Spread your seasoned carrots into a single layer on prepared baking sheet. Bake for 30 minutes or until carrots are tender. 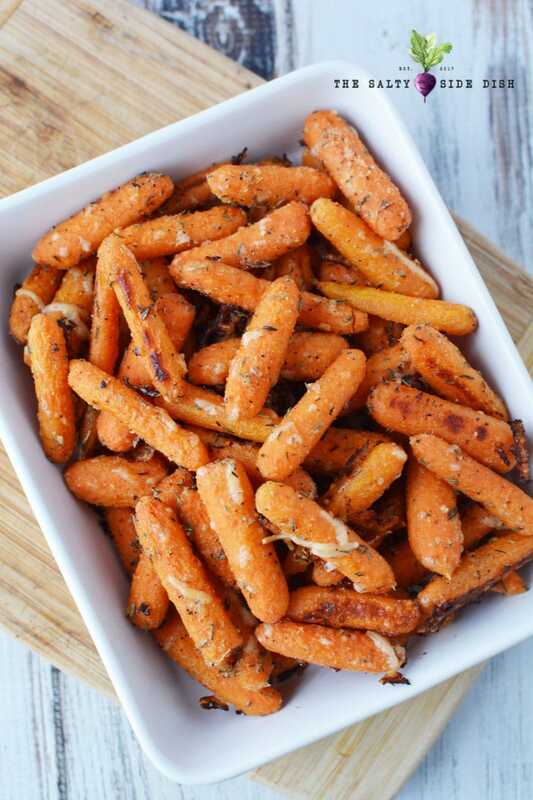 Parmesan Roasted Carrots with garlic and baked in the oven will provide you with a carrot side dish you cannot get enough of! Savory garlic and a fresh Parmesan cheese make every bite a mouthwatering treat. Add carrots to a mixing bowl and drizzle with olive oil. Mix well. Add seasoning and cheese and mix well. Spread into a single layer on prepared baking sheet.